This leading retail REIT has produced incredible returns so far this year, but why? 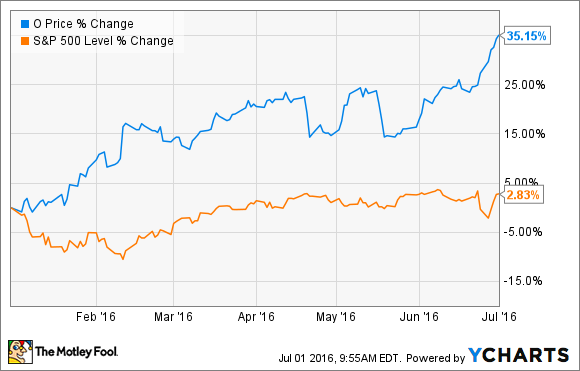 Leading retail REIT Realty Income (NYSE:O) has been on fire lately, and is up by 35% during the first half of 2016. Some analysts believe Realty Income and its peers are starting to look overvalued, and there's certainly a case to be made that they are, but there are some pretty good reasons for the big move to the upside. There are a few possible reasons for the incredible performance this year. First, Realty Income is a consistent stock in a volatile market. Although there is no such thing as a "sure thing" in the stock market, Realty Income isn't too far from it. The company's business model creates a predictable, growing income stream that has allowed it to increase its dividend 86 times since its 1994 IPO and produce a 17.8% average annualized total return. Second, Realty Income is only exposed to U.S. markets, which is desirable in the midst of global volatility. Plus, the properties Realty Income invests in are recession-resistant, which is obviously desirable since many experts are causing for the Brexit to lead to a recession. Finally, it appears that interest rates are going to stay low for much longer than the market was expecting. REITs borrow money to help finance their operations, and lower interest rates typically mean higher profit margins. Lowered interest rate risk can be a big driver of performance for companies that use borrowed money. At more than 24 times 2016's expected FFO, Realty Income is certainly on the expensive side. However, if the post-Brexit volatility remains high and interest rates stau at historically low levels for another few years, it may be well worth the price, as lower interest rates and the ability to issue shares at higher prices could lead to better-than-expected profits in the years ahead.